For some reason that we were unable to fathom, while we were in New York we were invited to cover a press event called Bogs Across America. Not even knowing what this meant, it was an invitation so insanely odd that we felt right from the off that it had Sowerby and Luff written all over it. Obviously “bog” does not have the same connotations in the U.S. as it does in Britain, and the hundred foot tall “Bogs” placard that greeted us at the Rockefeller Center was testament to this. Let’s face it, whatever the reason, 30 Rockefeller Plaza is a pretty cool address to show up at. The Crossroads of the World is how some Americans describe it. There’s even a TV show called 30 Rock. We had an hour to kill before we could enter the Bogs event with our press passes, so we wandered around the brightly lit Plaza. As she looked up at the 70 story Rockefeller building, Georgina sighed aloud and announced that this was the first time she’d actually felt dizzy at the sheer size and scale of Manhattan. Everything was floodlit in a soft peach-coloured hue, and tens of thousands of twinkly fairy lights adorned every tree in the square. Giant American flags fluttered outside all of the surrounding buildings, and the spectacular ice-rink – complete with lavish waterfall and huge golden statue – was being prepared for the evening. At the designated time we strolled back to 30 Rock, and entered the huge Art Deco lobby of the building. We asked the receptionist about the Bogs event, but he hadn’t even heard of it. I think it may have been his first day on the job. 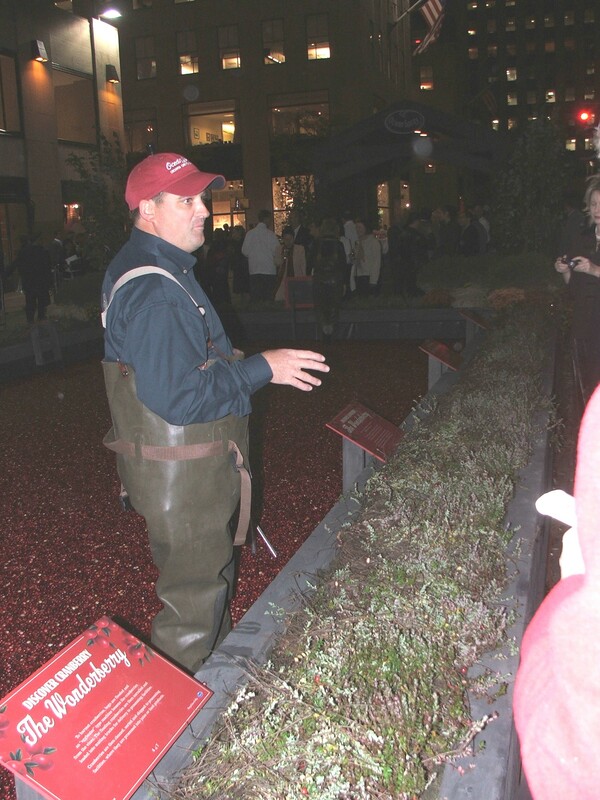 So, we wandered back outside, this time stumbling upon a tennis court-sized pit, filled to the brim with cranberries. “How did we miss this before?” I said. “We weren’t looking,” Georgina replied. To be fair, how often do you go looking for a tennis court-sized pit filled with cranberries? We were, of course, on the guest list, and gained immediate access to the Ocean Spray Bog, where we were handed a couple of alcohol-free, cranberry juice cocktails. I took Roland the MP3 recorder out of my pocket and we recorded a quick link for the podcast. “I’m guessing that Bogs Across America is something to do with cranberries,” I said, as Georgina and I described the strange scene for our listeners. Nearby, was a woman standing knee-deep in cranberries and giving an interview to a man with a microphone. Georgina started to laugh. “Look who’s doing the first interview,” she said, and to our amazement it was Podshow. What were the chances of us running into them in a cranberry bog? We waited our turn, then took Roland over to meet the lady in the bog. It was an odd sight – the centre of the plaza completely taken over by a huge pit filled with 20,000 lbs of fruit. “Why are we at the Rockefeller Centre talking about cranberries?” I asked the lady, who turned out to be called Irene Sorensen. “Because this is the Crossroads of the World,” she said. “What is a bog?” I asked her. “And why are we here now?” I asked. Most of the people around the bog seemed to be involved with Ocean Spray in some way, or actually worked for them, but there was a marked absence of media people or journalists. In fact, the only media we could identify was Podshow and Sowerby and Luff. The Rockefeller Bog wasn’t exactly hitting the headlines. Irene was generous and funny with her interview for our podcast, even though she didn’t have the faintest idea who we were. We finished by telling her that we’d never again eat Cranberry Sauce without thinking of her standing in that bog in Rockefeller Plaza. And we probably won’t. At the mention of alcoholic cocktails some thirty minutes later, there was a veritable stampede of guests towards the Brasserie Ruhlmann on 50th Street. Some people moved so quickly that the PR lady had to hold back the crowd outside the revolving doors of the restaurant. Once inside we picked up our press badges and followed our well-trained PR noses toward the unmistakable smell of Moet and Chandon. We were handed two tall glasses of champagne, with dried cranberries floating around inside, and were surprised to see that the cranberries floated up to the surface, then down again. Up, and then down again. It was very entertaining, and strangely hypnotic. But it completely ruined the taste of the champagne. “Do you have any bubbly without cranberries in?” I asked one of the waiters. But he just frowned, and walked away. Surrounded by Armani suits and designer dresses we felt a little under-dressed in our grubby jeans, but we downed as many glasses of fizz as we could, while watching a desperately dreary presentation about cranberries. “What’s that?” I asked another waiter as he sped past with a silver platter covered in delicious looking, but tiny appetisers. “This is French toast, with spicy lamb, on a bed of cranberries” he said. The nibbles may have been small but they were perfectly formed. A bit like Georgina. “What’s that one?” Georgina asked. “That’s garlic bread with a little Roquefort cheese on a bed of cranberries,” he replied. That press bash at Rockefeller Plaza must have cost a small fortune. Let’s hope for the sake of Ocean Spray that there were one or two real journalists there as well. The post Cranberries at 30 Rock appeared first on Sowerby & Luff.